Remove seeds from dried chiles and place all of the chile stock ingredients into a pot. Bring to a boil and remove from heat. Allow to sit for a half hour, then blend to a smooth consistency. Mix and prepare your spice blend. Dice the onion, zucchini and pepper. Mince the habanero and garlic. Rinse the beans. In a large pot, cook the onion, pepper, and zucchini in olive oil until they start to brown. Add the garlic and habanero and cook 1 minute. Add the spices and cook another minute. Add the tomato paste and cook 2 to 3 minutes. Dump in the chile stock and large can of tomatoes. Add the corn and beans and bring to a light simmer. Prep the seafood. This involves removing the beards from the scallops and scraping off any barnacles or fibers from the mussels. Halve the scallops and cut up the shrimp to match the size of the cut scallops. Cut the squid into rings. In a separate pan, heat up the white wine to a simmer. Add your mussels and cook for a few minutes until they all open. If some don't open, throw those away! Meanwhile, drop your prepped seafood into the simmering chili. When the mussels are opened, add them to the chili with the juices from the pan. After only about 2 minutes, the seafood is cooked. Remove from heat and serve with a garnish of cilantro. Normally when I make chili, I really go all out with fat. Bacon fat and butter to start, lots of braised meats, top with sour cream and cheese, and go into a food coma for four hours. Like most Americans, I have really packed on the holiday pounds. So this time I set out to make a chili loaded with the deep flavors I expect from the warming stew, but without all the meats and fat that normally come with it. 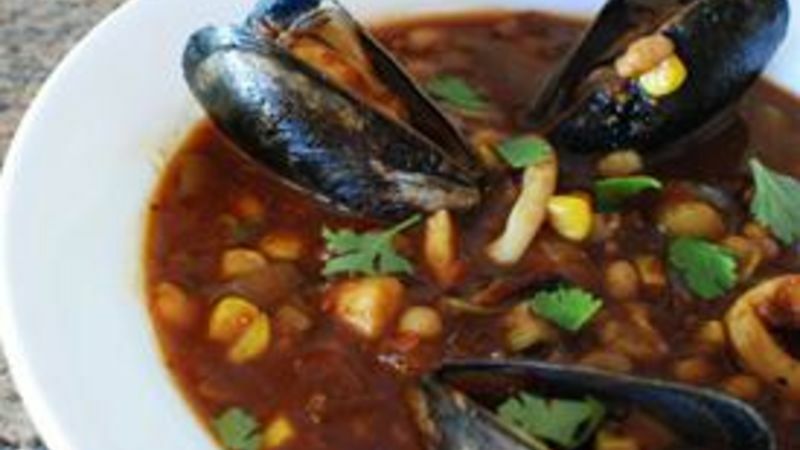 This seafood chili recipe is loaded with veggies, and more importantly loaded with flavor! Lots of people I know think chili is tomato-based, but a true chili is made with a chile stock. Pop these guys into a pot with hot water and let them steep for a while, then blend everything up and you’re ready to go. A nice spice blend to compliment the chiles and seafood. Make sure you get all the veggies prepped and ready to go before you start cooking. Veggies in the pot with some tomato paste really get layers of flavor built into this soup. At the last minute, the seafood goes in. It will be fully cooked in less than 2 minutes. Or that tasty, tasty mussel juice. It’s almost like a chioppino, but the flavors are chili all the way. Don’t be scared by the long list of ingredients. Any chili worth making should have lots of ingredients. This recipe really isn't that tough when you break it down into segments, and trust me when I say it’s totally worth it. Dan Whalen used to have muscles, but now he only has mussels. He has been blogging for almost 4 years at The Food in my Beard; check Dan's Tablespoon profile often to try his recipes with creative international spins!